A rite of passage for most kids is to identify with a larger-than-life fictional character on the big screen, and then to try to emulate them. Turns out, Angela Bassett was no different, and she remembers that back in the 1970s, the heroic options open to her were of a different caliber than are available today. “When I was growing up, I had Superfly, I had Shaft, those were the guys who were taking down the bad guys,” she told Entertainment Weekly. 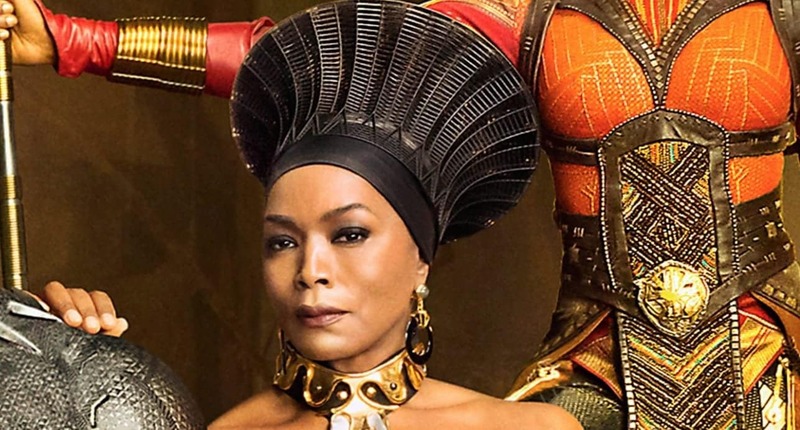 So imagine Angela Bassett’s joy over being a part of a groundbreaking moment in action filmdom where the “good guy” isn’t a pimp or a gun-blasting private eye, but the king of an advanced African nation, and where she gets to portray the royal matriarch! Bassett’s role as Queen Ramonda, in Black Panther, allowed the legendary actress to realize a childhood fantasy of being fairytale royalty, and to experience the very grown-up privilege of working with an award-winning black director on a film that has found its place in the history books, even before its nationwide release. The Black Panther movie, named for the first black comic book superhero (created in 1966 by Stan Lee and artist Jack Kirby) is poised to claw its way to the top of the box office February 16 with an Afro-futurist narrative and a cast of high-octane male and female characters. Black Panther tells the gripping story of T’Challa who, after the death of his father returns home to his technologically advanced African nation to take his rightful place on the throne as the king of Wakanda. Tested by powerful outside forces and a dangerous former enemy, T’Challa and Nakia must fight for the fate of their beloved country and the entire world. Black Panther is the 18th film to be spawned from the Marvel Cinematic Universe (MCU), according to CNNMoney, and the highly anticipated movie has already broken Fandango’s pre-sale ticket record for MCU films within its first 24 hours. Industry experts are projecting that the Ryan Coogler helmed project could open at around $150 million or higher. And according to Variety, a strong box office showing for Black Panther, which cost nearly $200 million to produce, would send a clear message to Hollywood that there’s tremendous opportunity to be found in making more movies targeting diverse audiences and featuring Black casts. The movie’s megawatt casting, with stars like Chadwick Boseman, Lupita Nyong’o, Angela Bassett and Michael B. Jordan, and jaw-dropping special effects, are sure to deliver an unforgettable experience for superhero fans. Backstory: Queen Ramonda is T’Challa’s stepmother and the Queen Mother of Wakanda. She married T’Challa’s father after his first wife, N’Yami, died giving birth to T’Challa. Queen Ramonda raised the future king from infancy, and as the only mother he has ever known, he loves her deeply. What makes her relevant: She is a fair and capable queen, and provides T’Challa with the sage counsel and motherly nurturing that even a noble warrior needs. Comics vs. Film: After the death of his father, T’Challa believed Ramonda left Wakanda to be with another man. Turns out, she’d been abducted during an uprising by a white supremacist who kept her hidden as a prisoner. Once T’Challa learned the truth, he freed Queen Ramonda and welcomed her back to Wakanda as the Queen Mother. Black Panther claws its way into theaters nationwide February 16.